Please select your Media and Foundation type from the menus below. Clicking Buy Now will take you directly to the checkout screen. PDF and CAD files will be delivered electronically. Please provide a valid email address. 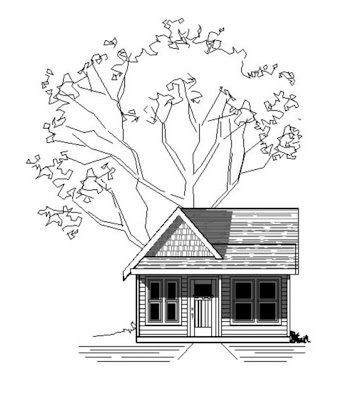 THE Carver, like our other tiny house plans, is named for a small community. Carver, Oregon was first settled in 1846 by the Horace Baker family. The name was changed a few times from the original Baker's Quarry (due to a massive basaltic rock formation) to Stone to Carver. Though the last two names were surnames, they fit the description of the history very well. The Baker cabin was built ten years later on the site and this day remains as a museum. A restoration kept the old homestead standing. The construction is of mortise and tenoned douglas fir logs with horse-hair for chinking. We think that some of our standard energy efficient construction details would be more appropriate. Much like the old cabin, we have a sleeping loft designed in, though ours is accessible from the inside. Can you imagine those cold pioneer nights, walking out of your hearth-warmed cabin and climbing exterior steps in the snow to go to bed? Rather than one open floor plan we locked ourselves in to creating a couple of code-minimum rooms and adding all else around that. The pocket office in the bedroom adds a kitschy little space that gives a little more room to the sleeping chamber. If you'd like more floor area, you can reduce the closet to a 2x4 reach-in and cover with a curtain. That's the beauty of small spaces; decor norms go out the window and creativity can shine. Since the mass of the porch is not right out of the front door, we moved our Tetris blocks around and formed the Carver A with a slightly larger porch and different loft. The Carver B is something entirely different. Build the Carver and indulge the inner pioneer! All plans include four elevations, floor plans, foundation plans, at least two building sections, framing plans for the second floor and/or roof, and notes and construction details. This is everything you will need to build, but may not be everything you need to get a permit. Check with your local jurisdiction. 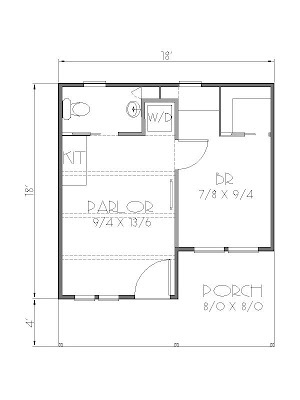 Electrical layouts, cabinet elevations and engineering are not included. Alert my inbox when new plans are uploaded! House plans designed by Jay Shafer. Live simply and save money! All plans, renderings, photos, verbage and great ideas © 2006, 2015 by istockhouseplans.com. Powered by Blogger.